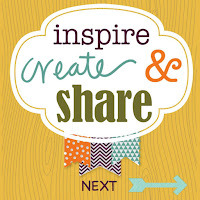 Hello and welcome to Inspire, Create, and Share's Blog Hop Introducing the 2015-2017 In Colors! In case you haven't heard these brand new In Colors are Cucumber Crush, Watermelon Wonder, Delightful Dijon, Mint Macaron, and Tip Top Taupe. If you've been hopping along, you should have arrived from the super talented Deb Naylor's Blog. I am LOVING these new colors! I keep changing my mind on which is my favorite but right now it appears to be a tie between Watermelon Wonder and Cucumber Crush. They are both such fresh, fun colors so I those them to focus on for my project this month. I started with a standard A2 card base of Cucumber Crush. I added a strip of some of the New Cherry On Top DSP Paper onto left side of my card. I then cut a 3 x 3 1/2" mat of Cucumber Crush cardstock and layered on more of the Cherry of Top DSP and then a smaller layer of Cucumber Crush. It has such fun bright colors and matched the Watermelon Wonder and Cumcumber Crush DSP perfectly! I stamped the ice cream cone base from the new Sprinkles of Life Stamp Set with Tip Top Taupe onto Whisper White cardstock. I fussy cut it out and glued onto the layered rectangle. 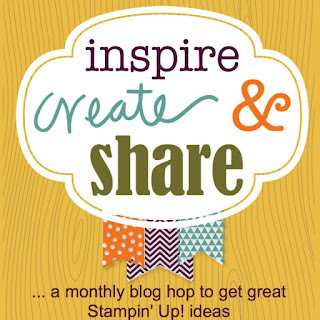 I stamped the ice cream top tone on tone onto Tip Top Taupe as well as the Watermelon Wonder cardstock. I then punched those out the new Tree Builder Punch. I adhered the layers of the ice cream tops over the cone. I then cut out three random width little strips of more of the Cherry On Top DSP and cut banner ends with the new Triple Banner Punch. I glued those under the right side of the rectangle and then adhered it all with dimentionals onto my card. I stamped my sentiment with Watermelon Wonder Ink onto Whisper White cardstock and cut out each line seperately at backed it with Cucumber Crush cardstock. I glued those in a random manner to the far left side of my card. I added a few Pearls and called it done. I really love how it turned out! Thanks for stopping by and make sure you click the next button to continue on! Tina, such a cute card! Such a fun card! Makes me smile! 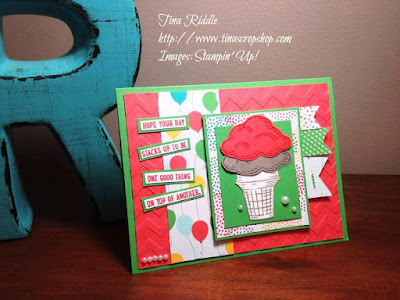 Love this card...so bring and colorful and HAPPY HAPPY HAPPY! Thanks for participating in our hop you ROCK! What a darling card! Lovin the colors! That's very cute! It reminds me of a fun scrapbook page!!! Such a bight and cheery card!! Very pretty, I'm loving that watermelon and cucumber combination! Super cute card Tina! Would make a great kids birthday card too. That is so sweet! Thanks so much Nancy! Super cute! I like how you did the saying! Congrats on the new hop! You rock Tina!